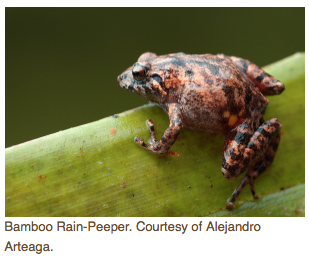 Alejandro Arteaga, a 19-year-old university student, talks about his discovery of a new frog species living in Ecuador’s Andean highlands, the Bamboo Rain-Peeper (Pristimantis bambu). He tells “The WildLife” host Laurel Neme how he and his colleagues traipsed through the forest late at night searching for tiny creatures with the aid of headlamps. The result was many seemingly identical little, brown frogs. At first, Alejandro grouped them as the same species, Mountaineer Rain-Peepers (Pristimantis orestes). However, after much hard work and observation, he uncovered differences in their songs and ecological preferences. He soon came to realize that those frogs that had a different song also were restricted to patches of bamboo forest, while the other seemingly identical frogs lived in old-growth montane forests and paramos. Neither habitats, nor songs overlapped. Discovering a species new to science is not an easy task but as, Alejandro notes, in the right place, with the right info, and with the right assistance, the task becomes much easier, and even fun.